The Arctic Circle lies at latitude 66° 33' 44" (or 66.5622°) north of the Equator. It marks the southern extremity of the 24-hour sunlit day (Midnight Sun aka Polar Day) and the 24-hour sunless night (Polar Night). The Arctic Circle passes though Norway, Sweden, Finland, Russia, Alaska (USA), Canada, Greenland (Denmark), and Grimsey Island (Iceland). Most of regions through which the circle passes are uninhabitable due to harsh cold climate, however several towns do exist within the circle. 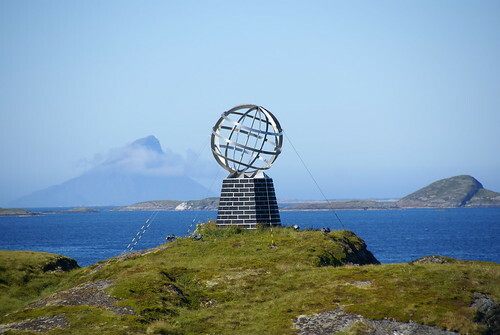 In few towns around the World, Arctic Circle Monuments/Markers have been erected generally on the travelling routes crossing the line and few places have amusement park or shopping place/cafeteria etc. to attract tourists. I have tried to locate such monuments/markers and placed marked these in Google Earth. Presently following locations have been identified and place marked. These are listed below in sequential order, travelling east from the Prime Meridian. 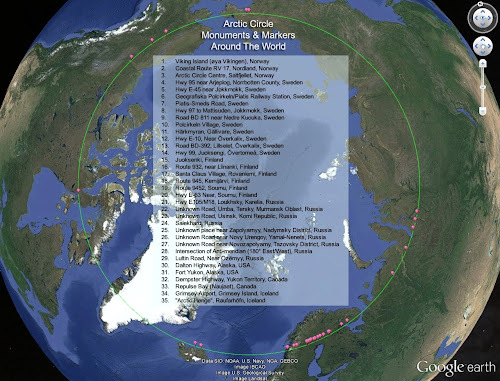 Most of these locations were found by moving along the Arctic Circle in Google Earth and Checking for Panoramio images and Google Street Views, especially at the roads crossing the Arctic Circle. The GE imagery at most of the locations is poor and it was not possible to accurately find the correct position of some of the monuments/markers. I have arbitrarily placemarked these places and will correct the location as and when I get more information about these monuments/markers. I Also request my readers to let me know if I have missed out any monument/marker or if there is any error or discrepancy in the description or location in Google Earth. 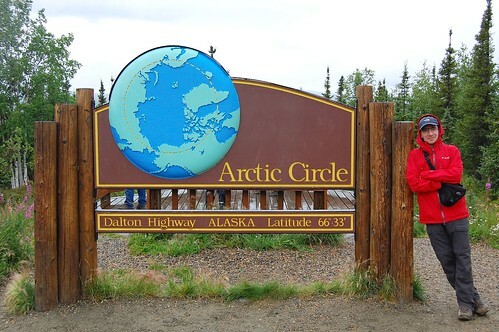 Although the Arctic Circle is officially defined at latitude 66° 33' 44" (66.5622°) but some monuments have been placed at 66° 33' 00" (66.55°). Sweden has maximum number of Monuments/Markers. Surprisingly there is no monument/Marker in Greenland (At least I couldn't find one). Most of the major Swedish highways crossing the Arctic Circle have a standard signboard which shows Arctic Circle cutting through the Map of Sweden with spot where the signboard is placed is marked on it by a red dot. 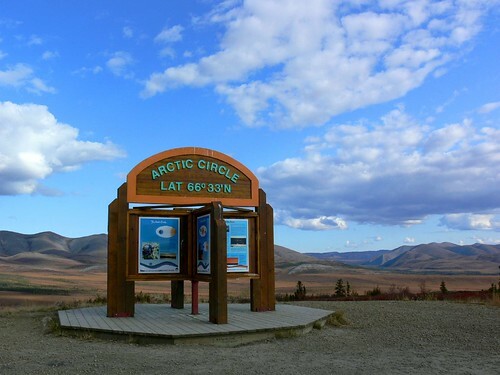 The signboards also have "Arctic Circle" written in 5 different languages - Swedish, Finnish, English, French and German. 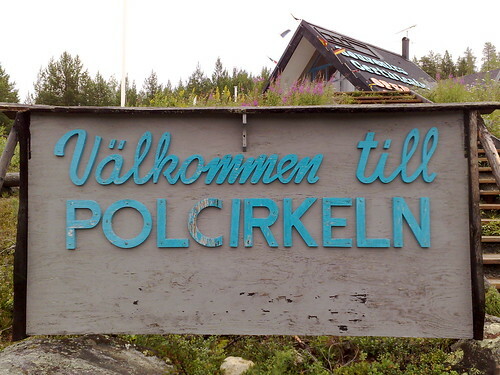 Finland also has standard signboard design, similar to Sweden, but the "Arctic Circle" is written in six languages instead of 5; Finnish, Swedish, German, English, French and Russian. 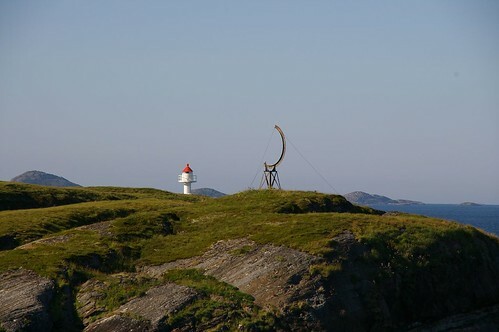 This monument on Viking Island, a small island in Rødøy municipality, Norway, is a favourite photographic object for travellers crossing the circle aboard a cruise ship. As per Hurtigruten In Pictures the Globe was blown away by hurricane "Arve" which passed over the island in January 2006 and has been built again on a solid base now instead of steel frame base. Following image shows the earlier monument after the hurricane. 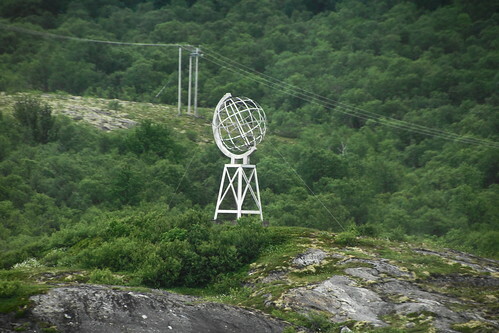 Saltfjellet region in Norway has marked the Arctic Circle in a big way by building a "Arctic Circle Centre" (Polarsirkelsenteret) at the intersection of E6 highway with the Arctic Circle. The Centre, which was opened on July 13, 1990, contains a cafeteria, a cinema, exhibition hall/information centre and souvenir shop. There are four monuments at the Arctic Circle Centre. 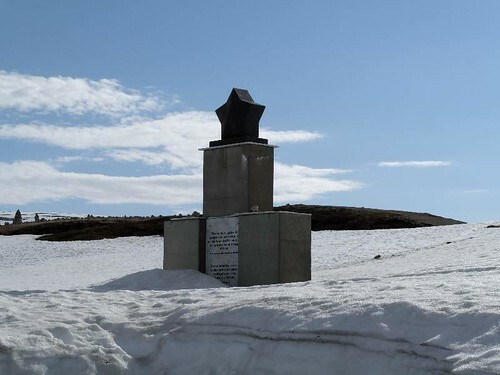 Three of these relate to the Arctic Circle and the fourth is a monument to those who died in the labour camps while constructing road/railway line during the Nazi occupation. Monument to those who died in the labour camps while constructing road/railway line during the Nazi occupation. A train stop near the Arctic Circle about 10 miles south of Jokkmokk on the Jokkmokk - Kåbdalis rail line. Google Maps names this as "Geografiska Polcirkeln" while Geonames has named it as Piatis Railway Station. The marker on this road is different from the other Swedish markers. A land art in the small village named "Polcirkeln" (meaning Arctic Circle) in Gällivare Municipality, Sweden. 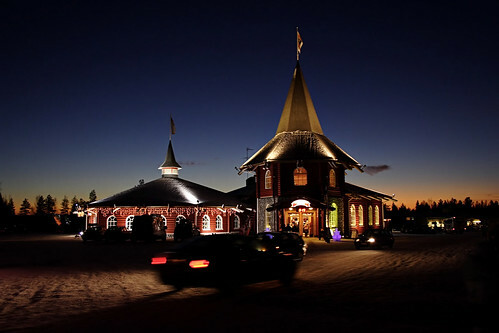 The most popular and famous location on the Arctic Circle is Santa Claus Village on the outskirt of Rovaniemi, Finland. Basically an amusement park, it has been declared as the official home town of Santa Claus. 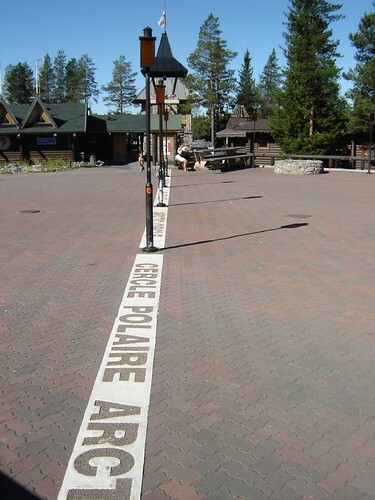 The Arctic Circle cuts right through the village and a white line denoting the Arctic Circle is painted across the premises. The line is a very popular photo spot for visitors. Besides Santa's office the village also has a Post Office, Souvenir Shop, Restaurant and a Children's Park. Arctic Circle line cuts through Santa's Office. Suomu is an alpine ski resort in the Lapland province of Finland, near the municipality of Kemijärvi. 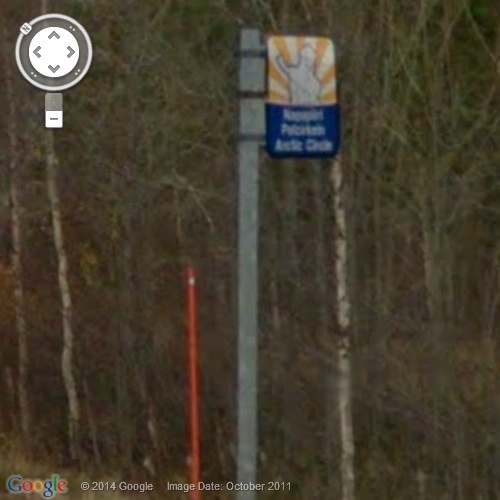 The resort is sometimes known as the Arctic Circle Ski resort because of its close proximity to the Arctic Circle. Salekhard is the largest town located on Arctic Circle and keeping up with this reputation, it has a big monument to the Circle. The Arch runs along the circle and the two tall towers are on north and south of the line. For some reason one of the tower is shorter than the other. A nice looking monument somewhere in Zapolyarnyy (Заполярный); an urban-type settlement in Nadymsky District of Yamalo-Nenets Autonomous Okrug. Found identical pair of Arctic Circle Monuments at 4 different locations. I feel that due to poor imagery these were not correctly located in Panoramio. I was also in dilemma where to placemark these on GE. One of the Panoramio image shows a monument on Novy Urengoy - Yamburg Route. I have therefore placed the GE placemarker at this location (I call it Location #2) and if needed, will relocate the placemarker, as and when I get more information or when the imagery of this area is updated and the monuments can be seen in GE. Above image is at Location #2, and identical monuments can be seen at Location #1 (18.5 km East) and Location #4 (30.5 Km West) from current location. 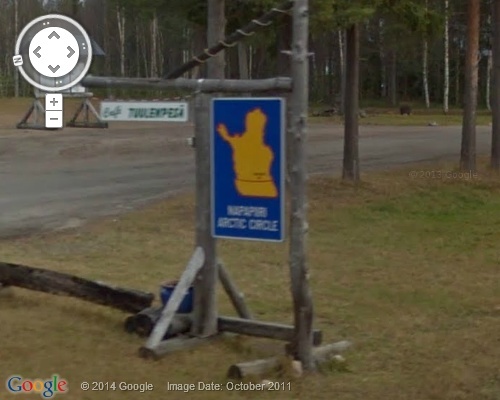 Image from Panoramio is by alexxd20 and was taken on Novy Urengoy - Yamburg Route. Above image is at Location #2, and identical monuments can be seen at Location #1 (18.5 km East) and Location #3 (21 Km West) from current location. The above two monuments are on left and right side of the road at the same location. While the third one, below is probably a bit away. 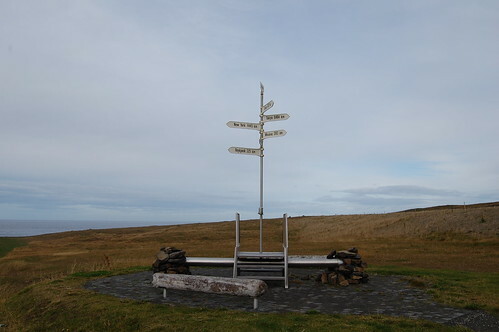 Instead of a major sign or monument at the intersection of Anti-meridian line with Arctic Circle, a nondescript and decaying sign. As per the photographer ".... intersection is two kilometers from the symbol up on the mountain". The title of the image says "Условное обозначение 180 меридиан", meaning "Symbol 180 Meridian". 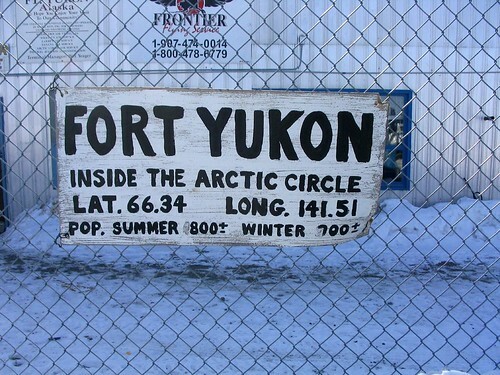 No major Monument/Sign at Fort Yukon, instead two ordinary signs. 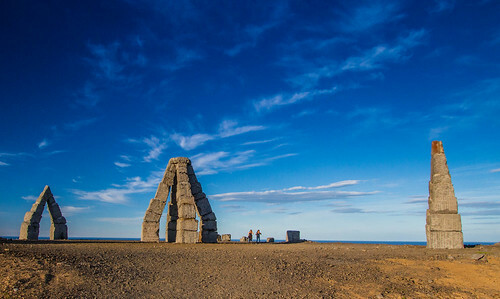 Although the Arctic Circle doesn't pass through the main land Iceland, however a huge monument called "Arctic Henge" is being built in its Northern town Raufarhöfn, which lies only a few kilometres below the Arctic Circle. 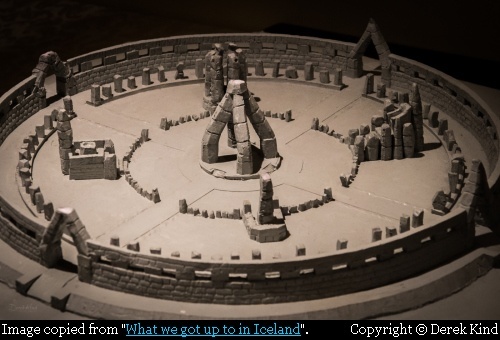 Arctic Henge based on Icelandic mythology and poetry, is planned to have several concentric circles made of stones. When completed its outer circle will have a huge diameter of 52 metres (170 feet). At the centre is a huge 4 way arch and four gates corresponding to the four seasons, and several other symbols. "(It) is being built to mark and catch the sun and other heavenly bodies as they move around the sky. Interweaving science, mythology, geography, and tourism, the project promises to be beautiful, educational, poetic and even transforming, a chance to feel the connection between a point on the surface of our planet and the light-bearing actors in the dramas of the heavens. Will it evoke for moderns what Stonehenge must have evoked for those who visited it at its height?" 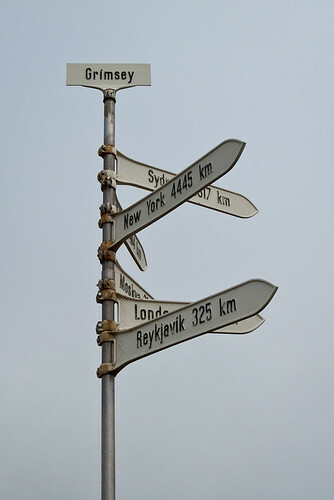 Image from Selka Kind's Blog "What we got up to in Iceland" is by Derek Kind. Sun seen through the north gate - image taken from the south. View All locations in Google Earth - Download kmz file.